During your event, a picture provides great souvenirs for your guest, but what if you can provide 11 pictures from different angle merged into one? It will create an amazing 3D GIF result and your brand will be remembered! We had here a need from our clients, so we took the challenge to innovate and create something the market is looking for, something unique in the world of photo booth. What is the iboothme 180 photo booth? We have created iboothme 180 shaped into a half circle, placed above our famous iboothme booth structure. iboothme 180 is powered with 11 DSLR cameras that will capture different angles of your guest and create an amazing 3D GIF sent instantly to them. 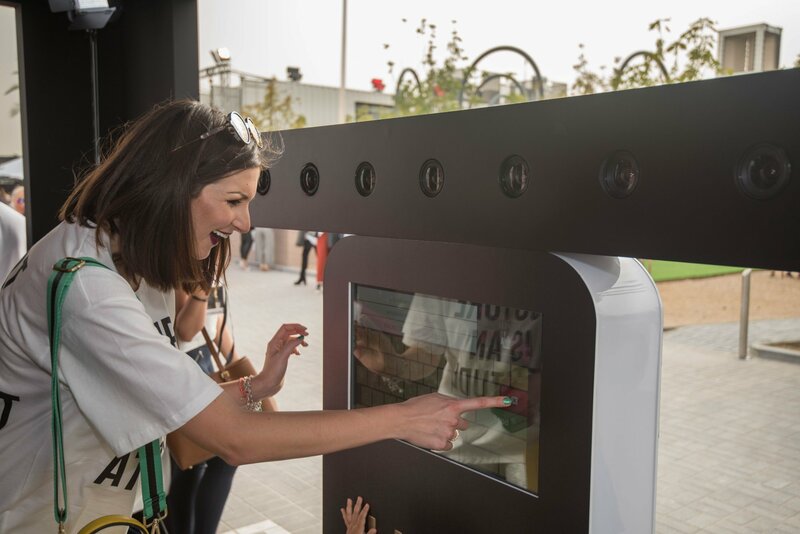 This is the first photo booth in the world that give the signals to 11 cameras to snap photos at the same time. No need for an operator to stand and press a button… It will leave all the freedom to your guests to operate iboothme 180 photo booth. Users can see themselves on the screen before snapping their photos. After entering their details the 3D GIF will be immediately sent to users for social sharing. Who likes to wait? It provides a complementary printed photo. How your brand can benefit from iboothme 180?